The cocoa E6 Flex Omni Earset Mic with Highest Gain and Detachable 2mm Cable from Countryman combines the best of the classic E6 directional earset with the best of the directional E6i. It is a vocal microphone with an adjustable boom that weighs less than one-tenth ounce. The E6 Flex can be used on either ear for capturing audio and rejecting unwanted sound, feedback, or surrounding noise from stage monitors or nearby speakers in houses of worship, theater, and outdoor vocal and speech applications. 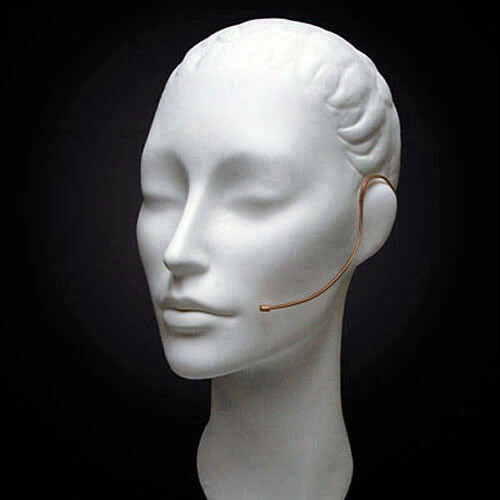 The low-profile, omnidirectional E6 Flex Earset virtually disappears against the skin, so performers forget they're wearing a mic. Three sensitivity options cover general speaking to extremely powerful vocals and four color options allow you to match the E6 Flex to your skin tone for minimum visibility. In addition, the E6 Flex Earset features a water- and wind-resistant omnidirectional microphone but is available as a pattern-changeable directional microphone for maximum isolation and gain before feedback. This Earset's cable terminates to a 3.5mm locking connector for direct connection to a Senal AWS-2000 wireless bodypack transmitter. The Countryman E6 Flex head-worn Earset combines the best of the classic E6 directional earset with the best of the directional E6i. The slim, springy ear section grips securely like an E6 classic, while the flexible front boom takes abuse like the E6i and allows precise placement and easy reshaping. It is small and lightweight, and is hardly visible from a distance. The E6 Flex Earset's stainless steel boom is built tough and can be bent and re-bent many times to fit different performers. The E6 is highly resistant to makeup, sweat, and moisture when used with the supplied protective caps. The flexible boom is easily shaped right on the performer's face and is available in multiple skin tones. The protective caps let you shape the frequency response for different situations or to match other microphones; caps for the directional earset adjust the pattern from cardioid to hypercardioid. Choose a sensitivity for speaking or singing with up to 145 dB SPL capability. The E6 Flex provides high-quality audio with low distortion and an SPL of up to 145 dB. It delivers rich, full band audio quality. Easy adjustment keeps the mic in position for rejecting unwanted sounds. Countryman omnidirectional earsets reduce feedback an average of 12 dB compared to an omnidirectional lavalier. Directional E6 Earsets provide even more isolation. Excellent for houses of worship, theater, and outdoor events. An E6 Flex replacement cable installs in seconds. The snap-on cables are rugged and available for almost any wireless transmitter or for XLR inputs with phantom power.